In stock. Order now for immediate despatch. We want you to discover new music. Let us help you find out more about our products. Ask us anything and we’ll do our best to answer your question. 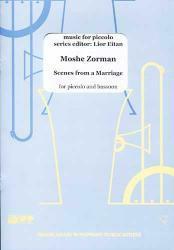 What do you want to know about Scenes from a Marriage for piccolo and bassoon? We publish questions and answers when they might be useful to other customers. We display your first name, your question and our answer. We do not publish your full name or email address. If you prefer for your question to remain unpublished, please check the box below. Please do not publish my question. Orders received before 12 noon (UK time) normally despatched the same working day. A full refund of your original purchase will be given upon receipt of the goods together with a written cancellation request. All items should be returned to us in good condition. The tutti newsletter delivered straight to your inbox. A fortnightly digest of classical music news & opinion, plus regular subscriber discounts and offers. It's FREE and you can unsubscribe whenever you like.